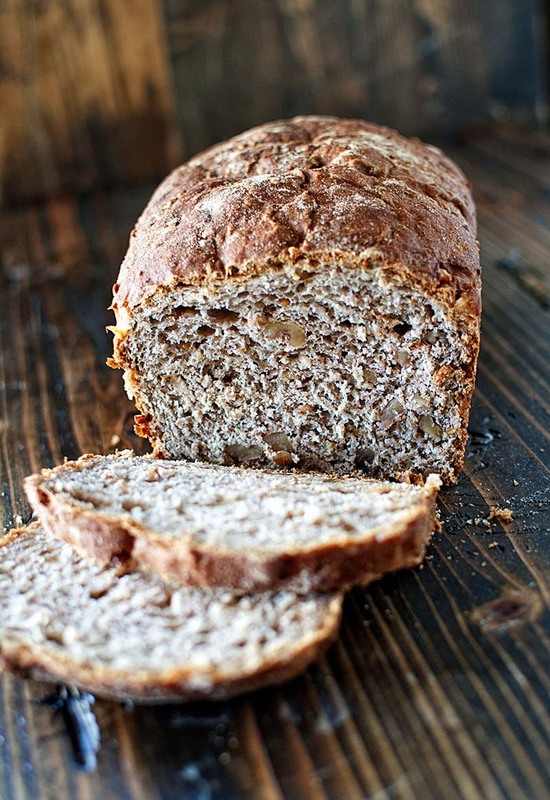 Hearty and dense sandwich bread using Bulgar wheat and filled with flavors of fall with apple cider and walnuts. Place Bulgar wheat in a small bowl and cover with ½ cup boiling cider. Stir with a spoon; cover and let sit for 10 minutes until liquid is absorbed. Place the remaining 1¼ cups apple cider in a medium saucepan and warm over low heat, just until it is warm - not hot - to the touch (110-115°F). Pour warm cider into the bowl of a stand mixer. Add yeast and brown sugar and mix with a whisk until yeast has dissolved. Let mixture stand for 5 minutes. Add 1 cup whole wheat flour, all-purpose flour, plumped Bulgar wheat, salt and canola oil. Using the hook attachment, mix on low speed for 1 minute to combine ingredients. Switch to medium speed and mix for 10 minutes. Dough will form a loose ball. Add walnuts and mix for an additional 2 minutes. Transfer dough to an oiled, medium bowl and cover with plastic wrap or clean towel. Let rise in a warm place (70-75°F) for 2 hours, or until almost doubled in size. Punch down dough to release air bubbles; turn dough out onto a floured surface. Form dough (use rolling pin or fingers to shape it) into a 12x6-inch rectangle, and position it so that a long side is facing you. Fold the 2 short ends onto the top so they meet in the middle. Starting with the closest end, roll dough away from you into a tight log, pinching edges to seal. Let rise at room temperature for about 1 hour; loaf will rise to slightly above the top of pan. While loaf is rising, preheat oven to 385°F. Remove plastic wrap, and dust top of loaf with remaining tablespoon of whole wheat flour. Place pan in center rack of preheated oven and bake for approximately 50 minutes. Finished loaf will be medium brown on top. Let cool in the pan on a wire rack for at least 30 minutes, then run a sharp knife around the sides of the loaf to release it from the pan. Invert pan to remove loaf. Let loaf finish cooling on wire rack. Slice and enjoy! Can I successfully use white whole wheat flour in this recipe? Yes, if your just substituting the white whole wheat flour for the whole wheat flour in the recipe, then it’s a 1:1 replacement (1 cup plus 1 Tbsp).